Don’t let the name of her blog fool you: Kristen over at Crafty Kristen has a heck of a green thumb in addition to mad knitting skills. She gifted me with a couple of bags filled with goodies from her garden recently as she was preparing to go spend a few days at the beach with her husband. I brought home yellow pear tomatoes (sweet and delicious), cherry tomatoes and eggplants. The only eggplant I’m familiar with is the big purple one. I remember seeing them when I was a kid, although I don’t recall whether my grandparents grew them, and I don’t remember ever eating them until I tried the ever popular eggplant Parmesan in college. I certainly never cooked an eggplant myself. 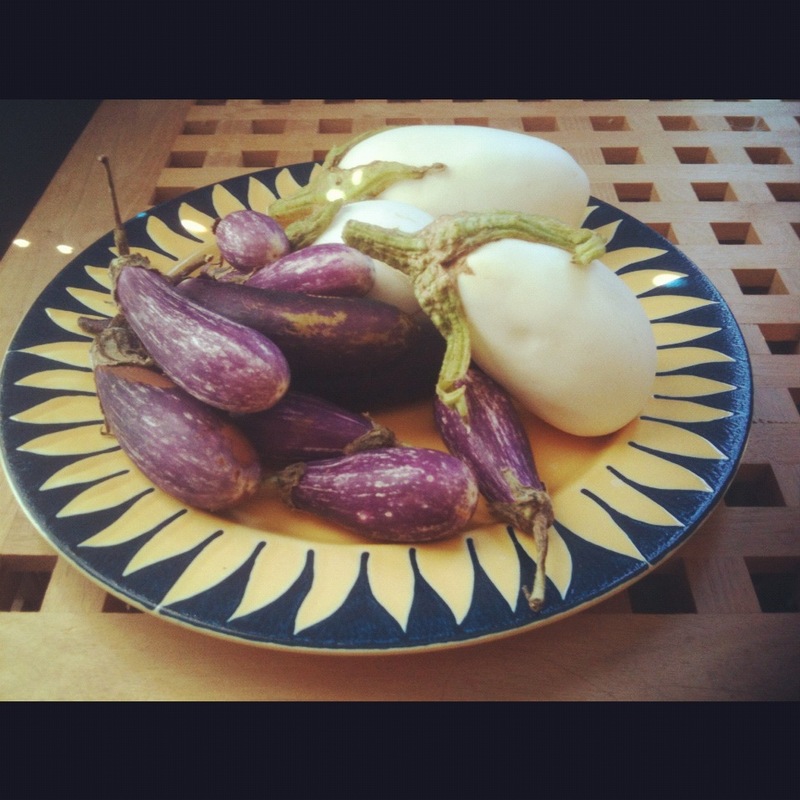 So when a CSA box arrived a couple of years ago with an eggplant inside, I faced a quandary. I made a baked version of eggplant Parmesan first — it was delicious, but not quite delicious enough to make up for the time it required and the mess it made. I finally found an easier eggplant pasta sauce recipe with a complex, garlicky flavor. It took care of the huge purple eggplants in the CSA box, and made enough that I had leftovers for at least a couple of days. Pre-eggplant season, Kristen had recommended a recipe for Pasta alla Norma, which I tucked away on Pinterest in anticipation of this year’s first CSA box. When she handed me a small plastic bag filled with the fanciest eggplants I had ever seen, I knew I couldn’t simply smash them into the gray (yet tasty) pulp resulting from my go-to eggplant pasta sauce recipe. It called for ricotta salata cheese, which I wasn’t entirely sure I could find at Publix. It called for deep-frying the eggplant, while I’m really more of a “lightly sauté” kind of girl. It called for sautéed onions WITHOUT sautéed garlic. Say what now? I made a few simple changes to the recipe and was psyched about the results. The sauce is very light, but the eggplant makes it filling. I found it made enough for two servings (I only cooked 2.5 ounces of penne rigate), with enough left over for lunch (no pasta, just the chunky sauce). You have to judge how much basil, eggplant and Parmesan cheese to use. If you want a heartier sauce, use more eggplant. Need more basil flavor? Tear up a few more basil leaves. It’s a forgiving recipe. Cook the penne in a pot of boiling salted water, stirring to prevent it from sticking together. While the pasta is cooking, make the sauce. In a saucepan, heat up a tablespoons of olive oil. Gently sauté onions until tender, then add undrained tomatoes. With the back of a wooden spoon, break up the tomatoes into small chunks. Add salt and pepper. Cook for a few minutes until the sauce has thickened. In another pan, sauté the eggplant in olive oil until golden. Add the sautéed eggplant and basil leaves to the sauce, and stir in a few sprinkles of Parmesan. Plate the servings of pasta and spoon sauce on top. Sprinkle with more Parmesan, if desired, and serve immediately. True confession: Despite growing up with ready access to my grandparents’ South Mississippi farm, I never learned to like cucumbers. Plates of cucumber slices would appear on the table throughout the summer, and I carefully avoided them. I eventually learned that cucumbers were delicious alongside other foods. First, a high school friend made me a cucumber sandwich, well-salted and slathered with mayonnaise, and eventually I discovered cucumber salads. 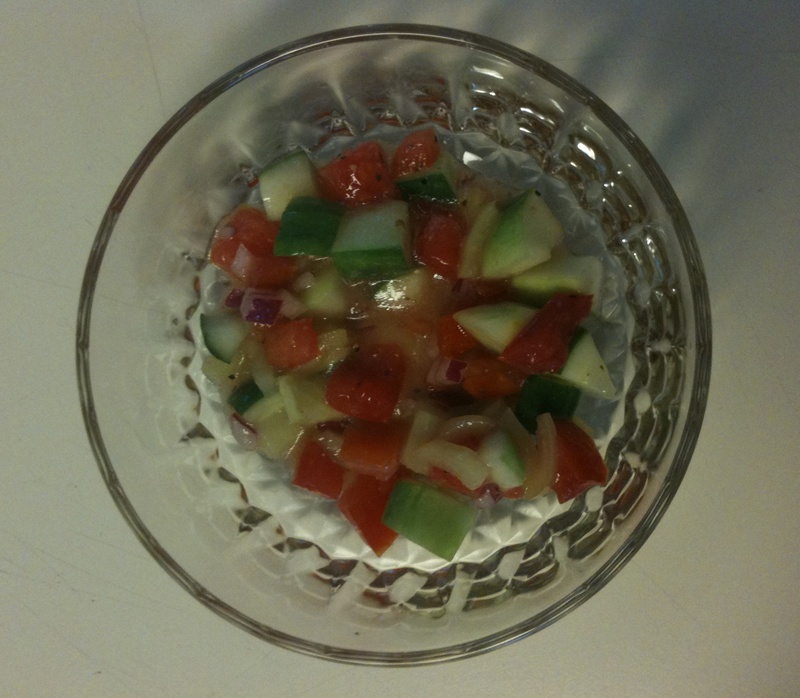 Mixed with tomatoes and an olive oil-based dressing, cucumbers became perfectly acceptable, if not well loved. These perfectly acceptable vegetables show up every two weeks in my CSA box, so I had to find a go-to recipe for a quick and easy salad. Christy Jordan over at Southern Plate posted a recipe last year that looked like every cucumber salad I had ever loved. As a bonus, it called for bottled Italian dressing, so all I had to do was chop vegetables. I pretty much just chopped up a cucumber, a medium tomato, a small red onion and a banana pepper, then coated the mixture with a few tablespoons of Italian dressing (the Southern Plate recipe calls for an entire bottle of dressing — I just can’t justify making the veggies slosh around in that much dressing). Marinated for two hours, the salad was the perfect accompaniment to eggplant pasta (also a CSA-inspired dish). Marinated for two days, it was an even better accompaniment for leftover eggplant pasta.